Data-display networks can be used for displaying affinities between any group of objects, especially those for which a distance matrix can be calculated. Their use is essentially as Exploratory Data Analysis (EDA), creating a visual display of the patterns of relationship (or affinity), without strong assumptions about the cause of the affinities. Philippe Gambette has, tucked away on a web page linked from his blog, a brief tree-based analysis of the scores for the finalists in the Eurovision Song Contest from 2006. It seems to me that these data illustrate some interesting things about the possible uses of networks in EDA, and so I will expand on the analysis here. For those of you who know little of this odd musical institution (held every year for a bit longer than I've been alive), I will provide a brief description. All countries in Europe (very broadly defined, being any country that is a member of the European Broadcasting Union) are entitled to submit a song for consideration, although some countries have never participated (and others have rarely contributed). The submitted songs are performed, and are voted upon by all of the countries participating that year. There were 24 countries represented in the Final in 2006: Armenia, Bosnia & Herzegovina, Croatia, Denmark, Finland, France, Germany, Greece, Ireland, Israel, Latvia, Lithuania, the Former Yugoslav Republic of Macedonia, Malta, Moldova, Norway, Romania, the Russian Federation, Spain, Sweden, Switzerland, Turkey, the Ukraine and the United Kingdom. The entries from Albania, Andorra, Belarus, Belgium, Bulgaria, Cyprus, Estonia, Iceland, Monaco, the Netherlands, Poland, Portugal and Slovenia did not make it into the final, but these 13 countries retained their voting rights. Serbia & Montenegro withdrew from the contest but also retained voting rights, resulting in 38 voting countries. Red = did not qualify for the final; green = qualified for the final; orange = non-participating in 2006; grey = never participating. Voting was carried out in 2006 by having each country assign scores of 1, 2, 3, 4, 5, 6, 7, 8, 10 and 12 to ten of the 24 contestants in the Final. The winner was the one who accumulated the greatest total. As it turned out, these totals ranged from 1 to 292 per song that year. Philippe Gambette suggests the Manhattan distance as a suitable measure of the relationships in voting patterns among the 38 voting countries. I will discuss this choice below, but for the moment let's proceed with this choice. I have visualized the distance matrix with a NeighborNet analysis. On this network I have superimposed some broad geographical groups as different colours. Countries that are closely connected in the network are similar to each other based on their voting patterns, and those that are further apart are progressively more different from each other. NeighborNet based on the Manhattan distance. Click to enlarge. I am sure that you can recognize the geographical groupings. Red represents the countries from Northern Europe and around the Baltic; green is for the countries from Eastern Europe; orange is for the countries of Western Europe; blue is for the countries from Southern Europe and the Middle East; and purple is for the countries from the former Soviet Union, in Far Eastern Europe. Clearly, given these definitions, some of the larger countries could be in more than one group (e.g. France, Poland); and I could, of course, have chosen any way of grouping the countries that I liked. However, I feel that it is noteworthy that the voting follows geographical lines, with few exceptions. Obviously, it is not geography per se that is reflected in the voting, but sociological influences associated with the geographical distributions of the cultural, political and language groups (see Clerides & Stengos 2006; Raykoff & Tobin 2007; Ginsburgh & Noury 2008; Spierdijk & Vellekoop 2009). This network is EDA and thus only a data summary, and so we should look at the patterns in more detail, to see how they are created. The Western European countries (as defined in my groupings) gave their big votes to Turkey, Finland, Bosnia & Herzegovina, Armenia and Greece (in that order). The Eastern European countries gave their big votes to Bosnia & Herzegovina, Russia, Finland, Greece, Macedonia and Croatia. Three of the countries are held in common between these two lists, with Finland highest. The Southern Europeans gave their big votes to Romania, Russia, Finland and the Ukraine. The former Soviet countries gave their votes to Russia, Bosnia & Herzegovina, the Ukraine, Sweden and Lithuania. Here, two countries are in common between these two lists, with Russia highest. The Northern European countries gave their big votes to Finland, Lithuania, Russia and Sweden, in that order. Note that the Finns (who won) appear on four of these five lists, while Russia (who came second) also appears on four of the five. However, Finland does not appear on the former Soviets' list, and Russia does not appear on the Western European list. This also makes it clear why the Finnish vote does not follow geographical lines: Denmark, Estonia, Greece, Iceland, Norway, Poland, Sweden and the United Kingdom, for example, all gave their 12-point vote to Finland, whereas Finland (who couldn't vote for themselves) gave their main votes to Russia and then Bosnia & Herzegovina. It is thus important to note that the winner's voting pattern will rarely be "geographical", because the competition regulations over-rule this possibility. Andorra (an outlier in 2006) gave their big points to Spain (which no-one else did) but the rest of their voting exactly followed the Northern European countries. The only other unique vote was the 12 points that Malta gave to the Swiss song. Armenia straddles two geographical groups in the network because they gave their big points to Russia and the Ukraine, but most of their other points went to Eastern European countries. Monaco has a long terminal edge because they gave many votes to Ireland and Latvia, which few other countries did. Austria, Georgia, the Czech Republic and Hungary all announced that they would not be participating in 2006, and Italy had not taken part in the Contest since 1997 (some of these countries are orange on the map above). Other qualified countries had never previously participated (and some still have not) (grey on the map). Based on the EDA analysis, however, we might be able to predict what their voting pattern would be. For example, we might predict that the Czech Republic, Hungary and Slovakia would vote with the Eastern European countries, while Azerbaijan and Georgia would vote with their former Soviet compatriots. Austria, Liechtenstein and Luxembourg are likely to have voted with the Western Europeans, while Italy and San Marino (and the Vatican City!) would presumably be more influenced by the Southern European choices. As noted above, an interesting question for EDA is the choice of distance measure. In particular, we need to consider whether double-zeroes (negative matches) should count as representing a similar voting pattern between two countries. Given that each country can vote for only 10 songs out of the 24 available, there will be between 4 (if there are no votes in common) and 14 (if they vote for the same ten songs) countries that are not voted on by any given pair of countries. Do these "double absent" votes count as a similar voting pattern or not? The above analysis assumes that they do, but this may not be a reasonable assumption, because the joint absence of at least 4/24 votes is a requirement of the rules rather than a natural choice of the voters. Once again, the competition regulations over-rule the possibility of geographical patterns — we simply do not find out how each of the countries would have voted beyond 10/24 finalists (or 10/23 when the voter is also a competitor). This is a clear case where absence of evidence is being treated as evidence of absence. This confounding of two sources of "experimental" variation seems to be a factor in most of the previous analyses of the Eurovision voting patterns that I have been able to locate, including those based on clustering (eg. Yair 1995; Fenn et al. 2006; Dekker 2008), ordination (eg. Yair 1995; Yair & Maman 1996; Doosje & Haslam 2005; Dekker 2008), multiple linear regression (eg. Bruine de Bruin 2005; Haan et al. 2005; Ginsburgh & Noury 2008; Spierdijk & Vellekoop 2009), z-scores (eg. Gatherer 2004), decision trees (Ochoa et al. 2009) and monte carlo simulations (eg. Gatherer 2006). In all cases, lack of a vote is treated as a score of zero rather than treated as "not applicable", so that absence of evidence (not applicable) is being treated as evidence of absence (a zero score). The only exception I found is the use of a censored regression model, such as the rank-ordered logit or tobit used by Clerides & Stengos (2006), where "not applicable" is treated as a censored observation. An alternative distance measure that ignores all double-zeroes is the Steinhaus dissimilarity (or Bray-Curtis similarity), which is basically the Manhattan distance standardized by the total of the scores for each pair of countries. Using this distance measure means that at least one of each pair of countries must have voted for a song before it counts as a measurement of the voting patterns. This does not deal with the issue of comparing a "not applicable" result with a vote, but does deal with the issue of comparing two "not applicables" with each other. NeighborNet based on the Steinhaus distance. Click to enlarge. Using this distance instead does, indeed, have a significant effect on the observed patterns of voting relationships shown by the NeighborNet analysis. Much of the geographical pattern is still evident in the network, but it is fragmented into subgroups. Note, in particular, that Poland (with its ambiguous geographical placement) changes its affinities but France does not; and most importantly, Finland nows joins its geographical neighbours, because the disruptive effects of the rules have been eliminated from the analysis. It is likely that the non-geographical patterns are related to some of the other factors that have been implicated to influence the Eurovision scores, such as performance order (Bruine de Bruin 2005; Haan et al. 2005; Clerides & Stengos 2006), host country (Bruine de Bruin 2005; Clerides & Stengos 2006), song language (Clerides & Stengos 2006) and possibly even song quality (Clerides & Stengos 2006; Ginsburgh & Noury 2008). The network analysis is thus an effective EDA tool because it has revealed confounded experimental patterns that have not been addressed by the previous statistical analyses. It is important to note that the difference between the Manhattan and Steinhaus distances is that the former considers patterns based on which countries are voted for as well as which ones are not, whereas the latter considers only the positive voting patterns. Since these distances produce different EDA data summaries, we can conclude that the strong "geographical" pattern shown by the Manhattan distance is, to a large extent, controlled by which countries are avoided in the voting rather than which are chosen to receive scores. I have long suspected that European politics works in precisely this same manner! Bruine de Bruin W. (2005) Save the last dance for me: unwanted serial position effects in jury evaluations. Acta Psychologica 118: 245-260. Clerides S., Stengos T. (2006) Love thy neighbor, love thy kin: Voting biases in the Eurovision Song Contest. Department of Economics, University of Cyprus, Discussion Paper 2006-01. Dekker A. 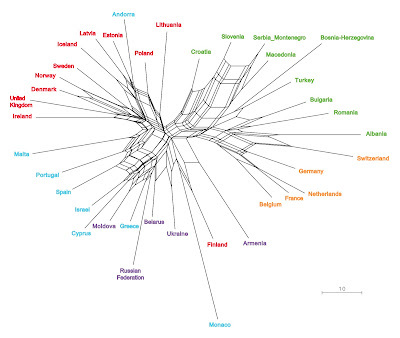 (2008) The Eurovision Song Contest as a ‘friendship’ network. Connections 28(1): 59-72. Doosje B., Haslam S.A. (2005) What have they done for us lately? The dynamics of reciprocity in intergroup contexts. Journal of Applied Social Psychology 35: 508-535. Fenn D., Suleman O., Efstathiou J., Johnson N.F. (2006) How does Europe make its mind up? 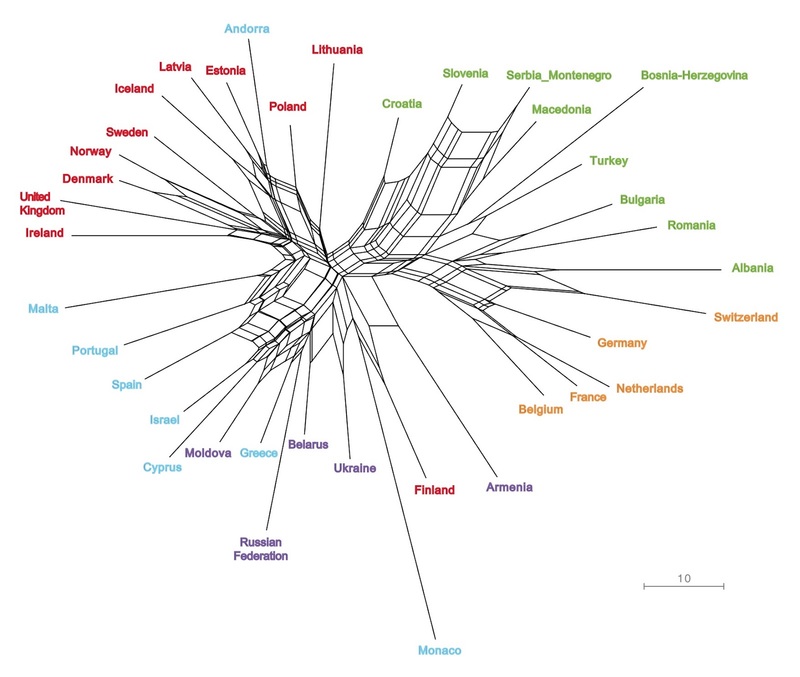 Connections, cliques, and compatibility between countries in the Eurovision Song Contest. Physica A: Statistical Mechanics and its Applications 360: 576-598. Gatherer D. (2004) Birth of a meme: the origin and evolution of collusive voting patterns in the Eurovision Song Contest. Journal of Memetics - Evolutionary Models of Information Transmission 8: 4. 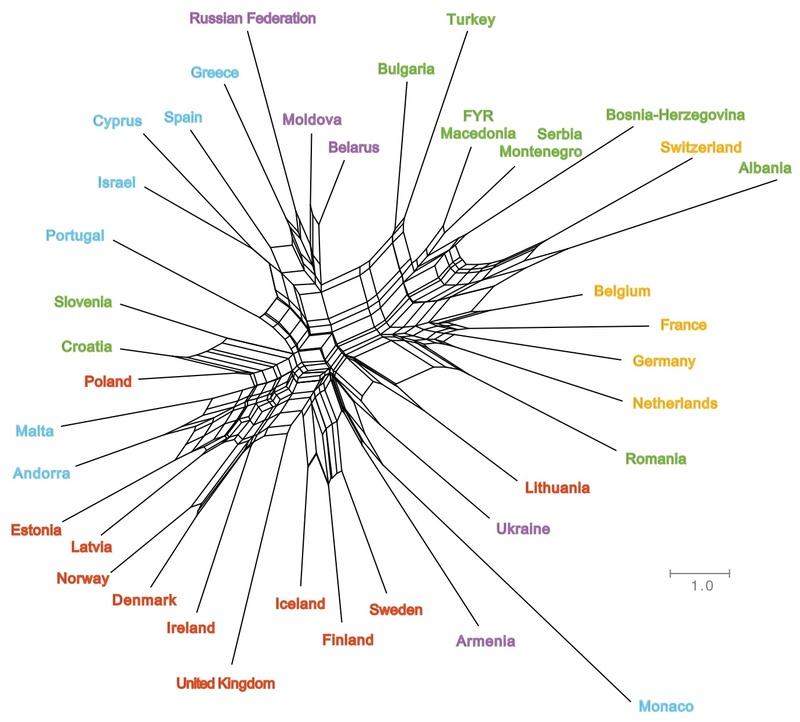 Gatherer D. (2006) Comparison of Eurovision Song Contest simulation with actual results reveals shifting patterns of collusive voting alliances. Journal of Artificial Societies and Social Simulation 9: 2. Ginsburgh V., Noury A.G. (2008) The Eurovision Song Contest: Is voting political or cultural? European Journal of Political Economy 24: 41-52. Haan M., Dijkstra G., Dijkstra P. (2005) Expert judgment versus public opinion: Evidence from the Eurovision Song Contest. Journal of Cultural Economics 29: 59-78. Ochoa A., Muñoz-Zavala A.E., Hernández-Aguirre, A. (2009) A hybrid system approach to determine the ranking of a debutant country in Eurovision. Journal of Computers 4: 713-720. Raykoff I., Tobin R.D. (eds) (2007) A Song for Europe: Popular Music and Politics in the Eurovision Song Contest. Ashgate, Farnham UK. Spierdijk L., Vellekoop M. (2009) The structure of bias in peer voting systems: Lessons from the Eurovision Song Contest. Empirical Economics 36: 403-425. Yair G. (1995) 'Unite Unite Europe': The political and cultural structures of Europe as reflected in the Eurovision Song Contest. Social Networks 17(2): 147-161. Yair G., Maman D. (1996) The persistent structure of hegemony in the Eurovision Song Contest. Acta Sociologica 39: 309-325.